Think homemade ice cream (without an ice cream maker), tofu, soft pretzels, and bagels; hand-made hot dogs, corn dogs, and pastrami; and your own canned tomatoes, vanilla extract, ginger beer and fermented sodas, miso, masa, and heaps, heaps more. 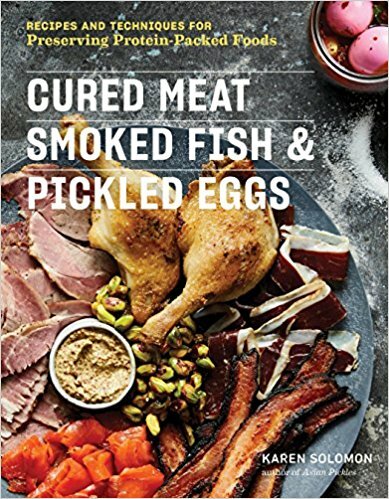 Can It, Bottle It, Smoke It and Other Kitchen Projects is the 2011 follow-up cookbook to 2009′s Jam It, Pickle It, Cure It, a lovely little ditty published by Ten Speed Press/Random House. These books are for serious kitchen nerds and the people they feed. Sure, we put food into jars (Ploughman’s pickle, a rollicking plum catsup), but there’s oh-so much more! The whole point of these books is not simply to make dinner, but to help you stock the pantry, fridge, and freezer with long-lasting, well-preserved foodstuffs that you will use in multiple meal preparations for weeks and months to come.